It can be extremely challenging to know when cats are in pain. Sure, sometimes it’s quite obvious. You know your cat is in pain when you see a noticeable limp, large cut, or observe an accident. But other times your cat’s signs of pain can be far more subtle. It’s at these times that people often need guidance on what to look for to know if their cat is suffering. Cats are masters at disguising pain. It's a survival instinct. 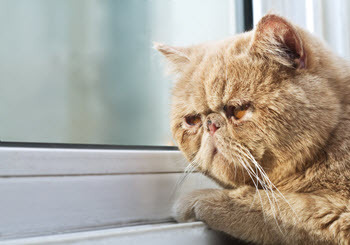 Cats often hide their pain, so look for subtle signs. 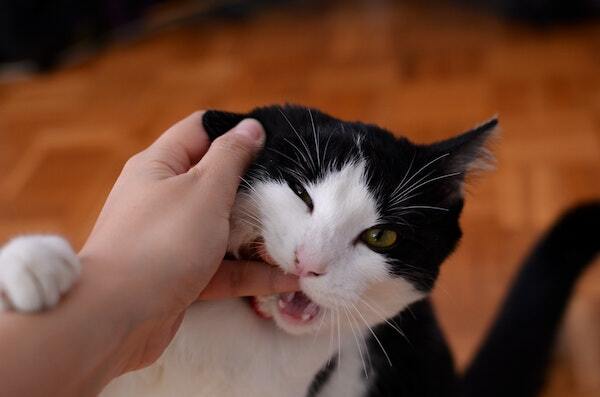 Cats in pain are more likely to bite, so be careful! Behavior, breathing, heart rate, and even appearance can all change when your cat is in pain. Always call your veterinarian if you suspect your cat is in pain. Never give your cat medication unless instructed to do so by your vet. As with many other aspects of caring for your cat, these signs will be more obvious to you (even when they're subtle) if you have a good idea of your cat’s “normal.” This includes they're normal attitude, energy level, gait, appetite, thirst, sleep patterns, and other physical and behavioral patterns. After all, if you don’t know what’s “normal” it’s much more difficult to recognize what’s not. Biting and Scratching: Cats in pain are more likely to bite and scratch. This is true even with their owners and other familiar people. This is particularly true when a person touches or moves the painful area, or if the cat anticipates you touching or moving the painful area. Breathing Changes: Cats in pain may have a faster and more shallow breathing pattern than normal. They may also pant. You may even notice a change in the movement of the abdominal muscles and/or those of the chest. Both of these sets of muscles are involved in the breathing process. Heart and Pulse Changes: Painful cats will often have an increased heart/pulse rate. The rate often noticeably speeds up when the painful area is touched or moved. Take a pet first aid course, or ask your veterinarian or one of the clinic's nurses to show you how to check and measure your cat’s heart and/or pulse rate. Purring: Just because your cat is purring does not mean they aren't in pain. If your cat is purring while showing any of the other signs here, the purring may be pain related. In fact, purring may actually increase in a cat experiencing pain. Eye Changes: The eyes can be strong indicators of pain in cats. This is true both for eye pain itself and for pain elsewhere in their body. Often times pain elsewhere in the body will result in larger (dilated) pupils, while pain in the eye(s) can result in either larger or smaller (constricted) pupils – depending on the underlying injury or disease process, and whether one or both eyes are affected. Squinting may indicate pain, either in the squinting eye(s) or elsewhere in the body. Similarly, a “bloodshot” appearance can indicate pain in the affected eye(s). Food and Water Changes: Cats in pain often eat and drink less. When they do eat and drink, if the cause of their pain is their teeth or some other part of their mouth, they may drop food and/or water out of their mouth. Grooming Changes: You may notice an overall decreased amount of self-grooming in a cat experiencing generalized or illness. However, a cat with a wound may excessively groom the area. Energy Level Changes: Most cats in pain will have a general decrease in their activity level. This often shows as a cat who sleeps more, but may also manifest as a cat who runs and/or jumps less than normal. Many cats will hide when in pain – choosing to spend time under beds or couches, or in closets. Be sure to check frequently for hiding, as it’s often a very telling sign. Mobility Changes: Cats experiencing pain often move around less. But depending on what hurts, they may still move around the same amount, just differently. They may move with a limp, or go more slowly up or down the stairs, or be less eager (or able) to jump the way they used to. If you've noticed any changes in your cat's mobility, or your cat is suffering from arthritis, please check out this article for some surprising facts and easy solutions to minimize pain. Bathroom Changes: Cats who have back pain, for any reason, may have difficulty with the posture needed to defecate. Because of this they may struggle to go to the bathroom. Sometimes they may even become constipated in the process. However, pain itself can also lead to slowed motility of the intestines, and thus lead directly to constipation, too. Cats with joint or bone pain may also have difficulty getting into their litter boxes, so they may start urinating and/or defecating outside of their boxes. Body Contour Changes: Swellings, be they on your cat’s legs, body, or face, could be an indication of a painful condition, such as cat bite or tooth root abscess, inflammation, cancer, or something else. Thanks to Dr. Duncan Lascelles, one of the foremost experts on pain in cats (No, really ... I mean it! Dr. Lascelles is a cat pain guru! ), and his team at North Carolina State University College of Veterinary Medicine there is now a whole website dedicated to assessing and addressing pain in cats. Dr. Lascelles' website even includes a helpful questionnaire to help you determine if your cat might be "suffering in silence" from pain. Below is a short video they produced that takes you through some of the aspects of cat pain. While it’s quite obvious and intuitive that a broken bone, gaping wound, or recent surgical procedure will likely be painful to your cat, those aren’t the only reasons for pain. There are lots of other common conditions that cause pain that often goes unrecognized by cat owners and therefore untreated by their veterinarians. If your cat has been diagnosed with any of the conditions below, be sure to speak with your veterinarian to make sure that any painful aspect of the condition is being treated properly. In fact, if your cat is diagnosed with any medical condition, it is always a good idea to ask your veterinarian if there is any pain component. If there is, ask what options there are for treating the pain. Cancer – especially bone cancer, squamous cell carcinomas of the mouth, any type of cancer that enlarges a capsular organ (e.g. a kidney or the spleen), and tumors that press on important internal structures. It’s important to speak with or see your veterinarian any time your cat is in pain, or you’re thinking that they may be. Not only is it important so that the underlying cause of the pain can be determined and appropriately treated and managed, but also to avoid tragedy. Many pet owners – even pharmacists and "human" doctors and nurses – have inadvertently caused toxicity or further injury to their cat by self-prescribing medications without first checking with their veterinarian. That is certainly a pain and heartbreak you don’t want to bring upon your cat and yourself!